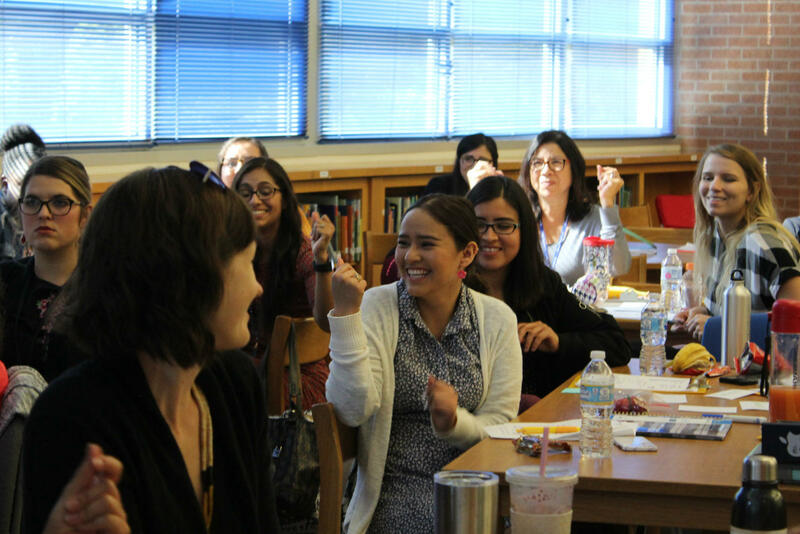 Teach for America Corps member Perla Torres, center, snaps her fingers in appreciation of something one of her new coworkers said during Democracy Prep's teacher in-service. Every school year brings changes. New teachers. New classmates. But the school year, which began Monday, brought more changes than usual for the students at Stewart Elementary. While their school continues to be a part of the San Antonio Independent School District, the south side elementary is now being managed by charter operator Democracy Prep. TPR's Camille Phillips reports on Democracy Prep's preparations for its first year managing SAISD's Stewart Elementary. Democracy Prep spent the late spring and summer putting those changes in place, including hiring a new team of 37 teachers and specialists. A few days before students returned to the classroom, the team of teachers hired by Democracy Prep gathered in the sunny school library for a training session on the power of words. Silva led her staff through an exercise, reading cards with negative phrases like “LEP kids” aloud and matching them with positive alternatives. Bilingual reading teacher Miguel Rodriguez told the group that LEP, which stands for Limited English Proficiency, hits close to home for him. 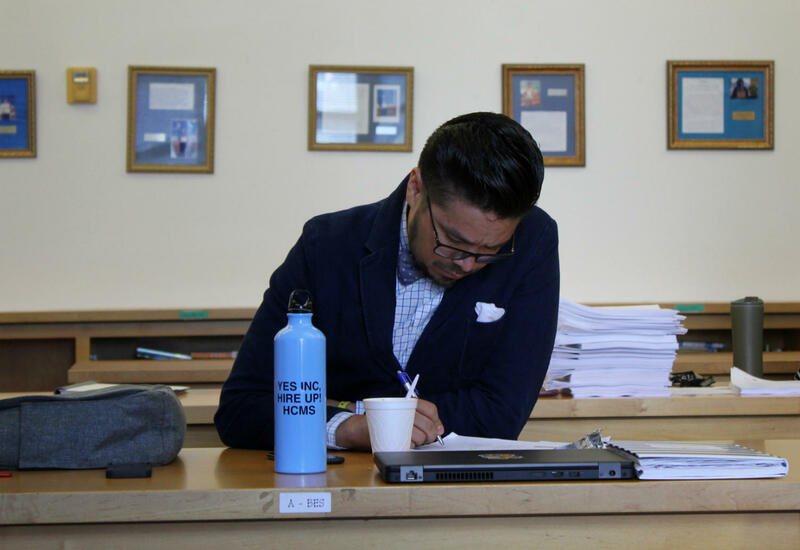 Bilingual reading teacher Miguel Rodriguez takes notes during teacher in-service at Democracy Prep at the Stewart Campus. “I remember that I was a LEP kid, growing up in California going to school. And there’s a Spanish word, lepra, for leprosy in English. So that’s what came to my mind when I was told I was a LEP kid. I was like, ‘Okay, so do I have lepra?’ ” Rodriguez said. He’s new to the school, as are most of his coworkers. They’re employed by Democracy Prep, not SAISD. And they’re working without a contract, which means they have less protection from being fired. Many Stewart teachers urged the school board not to partner with Democracy Prep for that reason. When the dust settled, only two decided to stay at Stewart: third grade teachers Morgan Brewer and Vianca Gutierrez. “I think that not having that contract really holds me accountable to a higher standard,” said Brewer, who was a first-year teacher at Stewart last year. Gutierrez is a bilingual teacher who started teaching at Stewart two years ago. Originally, San Antonio ISD arranged for Democracy Prep to take over Stewart because partnering with a charter school gives the district a two year reprieve from stiff state sanctions going into effect this month. But, according to the district’s preliminary calculations, Stewart made enough gains on standardized tests this year to meet state standards. That means Stewart wouldn’t have faced sanctions even if Democracy Prep hadn’t taken over. Teacher union president Shelley Potter said that shows the charter takeover is unnecessary. “It would have been better for the students, better for the community, if the teachers who had helped to do this work — to help get Stewart out of improvement required status — were still at the school,” Potter said. However, SAISD Superintendent Pedro Martinez said there are other reasons to partner with Democracy Prep. “Even though Stewart made it out, they’re still below the district average on achievement. And the real goal now is not to maintain the results but actually significantly build on it, especially when it comes to achievement,” Martinez said. But in order to make those gains, Democracy Prep first needs to fill classrooms. Last school year, the campus taught a hundred fewer students than the year before. This year, enrollment is expected to drop by another hundred amid confusion over the takeover. LaToya Tabor registers her daughter Honesty for school at Democracy Prep at the Stewart Campus. About a mile down the road from Stewart, less than two weeks before the first day of school, staffers set up a table in the community room at Rosemont Apartments to answer parent questions and register students. Their records show that 20 elementary kids live in the apartment complex located about a mile from Stewart, but less than half are enrolled at the school. Family impact coordinator Michelle Herrera asked the children playing in the community room to tell their moms to come down. A little while later, LaToya Tabor walked in, cool and casual in a gray cotton dress and sandals. Herrera handed Tabor a tablet, and helped her fill out the online registration form. In the past two years, Stewart has lost about a third of its students. It’s unclear why, although the district points to the school’s low academic performance. 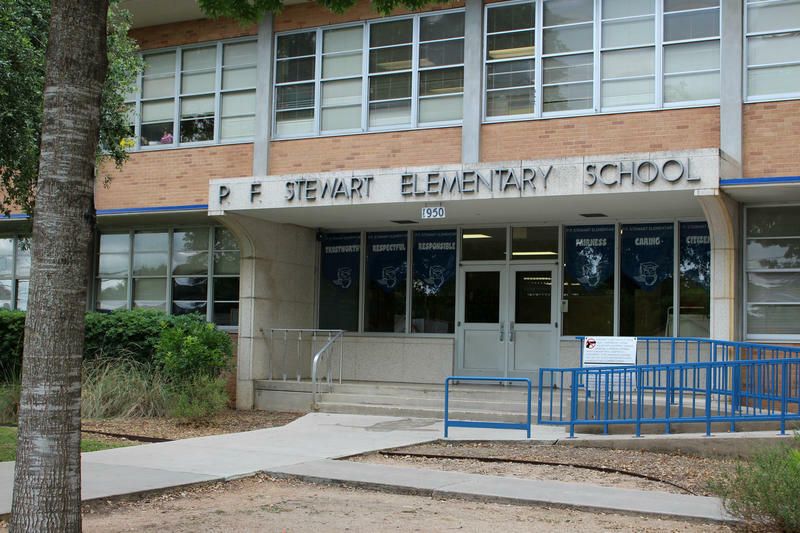 Jeremy Jones, the executive director of Democracy Prep San Antonio, said he and his staff have spent the summer calming parent fears and convincing them to send their children back to Stewart. Martinez said he and the school board wanted to partner with Democracy Prep to build innovative, high-performing options on the Southside — a part of the district with half a dozen low-performing campuses and comparatively few specialized schools. If Democracy Prep delivers results for Stewart, SAISD has committed to a 10-year contract that lets the charter operator expand through middle and high school and serve up to 2,400 kids. At current funding per student, the district could eventually pay Democracy Prep more than 25 million dollars a year. 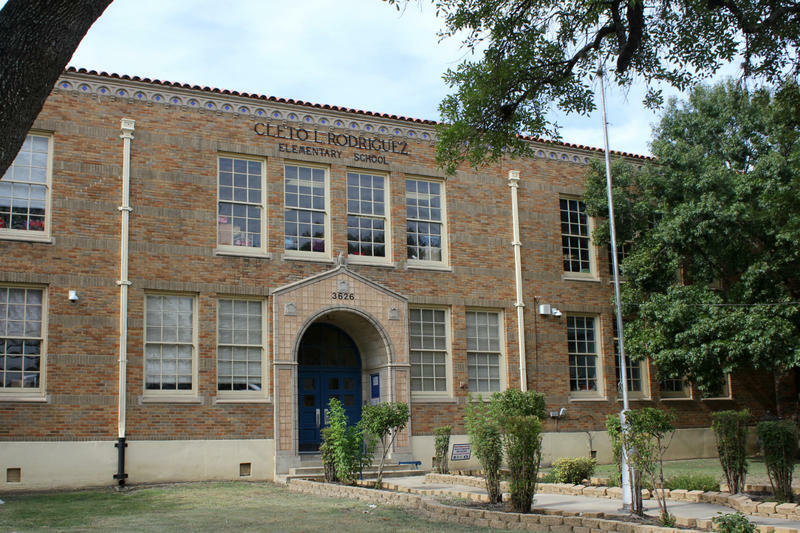 Rodriguez Elementary in the San Antonio Independent School District will likely close at the end of the 2018-2019 school year. According to internal district calculations, the west side elementary failed to meet state academic standards in 2018, subjecting it to new mandatory state sanctions. TPR's Camille Phillips reports on the impact of new state sanctions on SAISD. Bexar County Judge Karen Pozza Monday denied a request from the San Antonio Alliance teachers union for an emergency injunction to block charter operator Democracy Prep from taking over Stewart Elementary. The contract between the San Antonio Independent School District and Democracy Prep is slated to go into effect July 1.